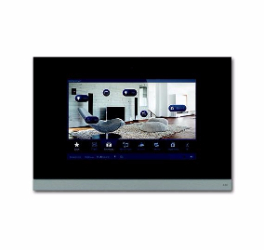 Free programmable IP/KNX touch display can be used as a control, infotainment and entertainment centre for the whole house With a closed capacitative glass surface and a design strip made of stainless steel (brushed). With integrated camera. Easy control using intuitive navigation concept. House control: switching, dimming, blinds, RTC, scene/sequences, timed controls Entertainment: Multimedia, remote control RC5 and B&O. Infotainment: IP telephony, RSS reader, intercom with picture, e-mail, voice and graphic memo, consumption data monitoring. Door communication: Indoor station for the ABB-Welcome system in combination with IP gateway 83341. Safety: video surveillance with IP cameras, alarm function, message function, presence simulation. Representation from individual floor plans, room images and operation pages. 31 cm (12.1") touchdisplay with 1280 x 800 pixel. Compatible with ABB i-bus® KNX Maintenance via remote control over IP. 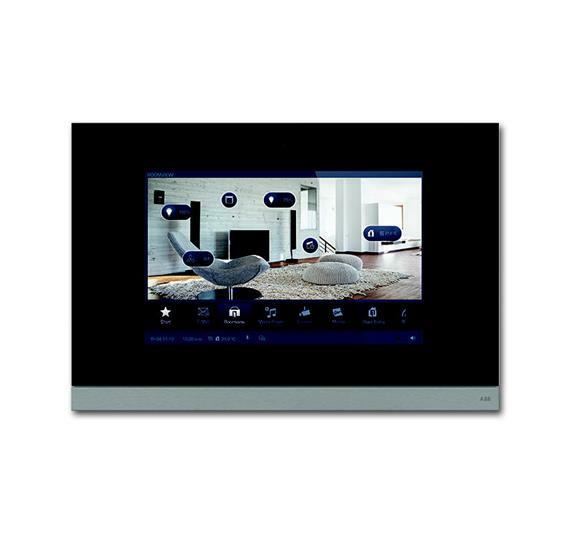 Control with smartphones and tablets via the ComfortTouch App (Apple iOS /Google Android from Version 4).